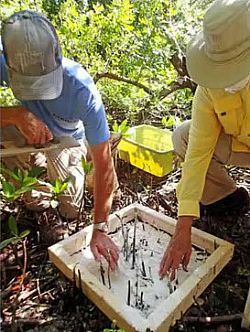 A site in northern Tampa Bay is being used to test methods for monitoring how coastal habitats respond to long-term changes in climate and water levels. The pilot project, jointly funded by TBEP and the U.S. Fish and Wildlife Service, is the first step in creating a comprehensive plan to monitor the impact of climate change on the bay's mangroves, salt marshes, salt barrens and coastal uplands. The plan is designed to detect both small- and large-scale changes in abundance and ecological function of these vital habitats, to better help bay managers prepare for and adapt to the changes. TBEP has contracted with the consulting firm Atkins Global to conduct the work. A team from Atkins. Ecological Science Associates and TBEP conducted a field test of monitoring techniques and tools at Upper Tampa Bay Park in summer 2014. They collected baseline measurements and established permanent fixed-station monitoring grids across the full range of coastal habitats from the water's edge to upland areas. The stations will enable scientists to document changes in plant species and abundance, land elevation, water levels, and salinity gradients over time. This pilot project will help determine the most time- and cost-saving monitoring techniques, so we can expand our studies to more sites around the bay.